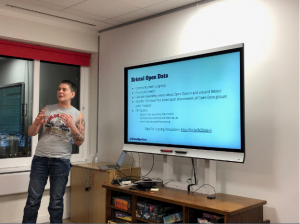 Bristol Open Data is a meet-up group focused on promoting the use and publication of Open Data in Bristol and the surrounding areas. The group is run by a group of volunteers active in the field. 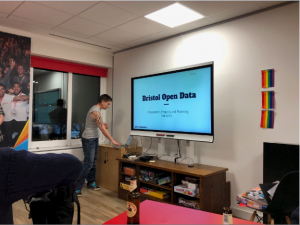 Additionally, the group is an ODI Community Node, with a focus on continuing to build and support an open data ecosystem for the City of Bristol and the surrounding areas. Last night saw a range of individuals meet up to explore how to take the group forward and the sorts of activities that could be undertaken. Everyone got involved with the planning, in part thanks to delicious pizza and beer on tap. To help inspire the group with ideas Jamie Whyte, from Open Data Manchester, gave a fascinating presentation the innovative work his organisation has been involved in. These include training, community events, open data community sharing, consultancy, internet of things and so forth. Finally, a special shout out to Jen Williams for organising the event as well as Just Eat for providing the venue, food and refreshments.